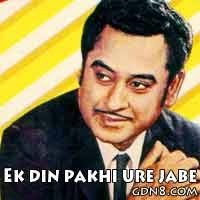 Ek Din Pakhi Ure Jabe Je Akashe Song is Sung by Kishore Kumar. Music composed by Rahul Dev Burman And Ekdin Pakhi Ure Jabe Bengali Song Lyrics Written by Mukul Dutt. This is Tum Bin Jaoon Kahan Bengali Version. Same Song Is Sung by Kumar Sanu And Music Recreated By Indraadip Dasgupta from Kishore Kumar Junior Bengali Movie. Starring: Prosenjit Chatterjee, Aparajita Auddy, Rwitobroto Mukherjee And Others. This bengali Movie Directed by Kaushik Ganguly. Firbe-na se to ar.. karo akashe..
Buke jeno badoler oi, megh jome na..
Mon venge dite jeno ar, jhor ashe na..
Taare vebe karo chokhe jeno jol na ashe..
Udashir banshi ar keno, keu to shone na..
Kono-din keu tar keno, mon to bojhe na..
Ghor chere konodin jeno seshe pothe na boshe..